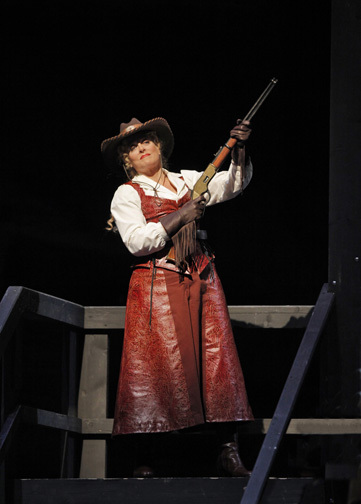 When Deborah Voigt appeared on stage in a pair of red leather chaps astride a horse in the final scene of the San Francisco Opera's production of La Fanciulla Del West, I almost fell off my chair. The company's take on Puccini's not very beloved opera set in the gold rush days of California and based on David Belasco's play The Girl of the Golden West made for the most fun I have ever had in an opera house. Ever. I loved everything from the kitschy love scenes ("kiss me!" "erm, have some pastry?") to the swaggering male chorus of gold diggers braying for blood, to the enjoyment of watching a spaghetti western that wears its Italian production values on its sleeve. It's very hard to take the opera seriously, For one thing, it's hilariously politically incorrect. Racism against Native Americans and Mexicans abounds and it's pretty sexist. For another, Andrew Lloyd Webber poached mercilessly from the opera, so the already surreal experience of watching a bunch of opera singers in Levis and cowboy boots singing in Italian against a wild west backdrop is rendered all the stranger for hearing note-for-note echoes from The Phantom of the Opera along the way. Pure genius. I expect that the critics are going to be sniffy about the production. It's really just fluff and spectacle and good old fashioned cheese. There is some lovely word painting in the score (such as the night time sounds of winter weather swirling around the heroine Minnie's mountainside cabin) which the orchestra brought off beautifully. But besides the bravura final aria sung by the condemned bandit Johnson (aka Ramerrez) played by Salvatore Licitra, there aren't many memorable musical moments (at least, ones that haven't been stolen by Lloyd Webber). Plus, conductor Nicola Luisotti should get a slapped wrist for allowing the orchestra to drown out the singing during some of the more dramatic moments. This is no mean feat considering that Voigt, one of the biggest female voices in opera, is on stage. There's nothing deep or important about this work. What themes can be eked out of the story e.g. about the madness and crime that comes from greed, might have had greater relevance if the San Francisco Opera had chosen to stage the work during the dotcom boom ten years ago. But who cares really? The performers look like they're having a ton of fun with this show and their enthusiasm is infectious. The action doesn't let up. It moves along as fast as an episode of Bonanza and leaves us for dust. I certainly won't forget that finale in a hurry. Not only do we get to see Voigt on horseback, but she and her leading man also get to ride off into a golden sunset on a wagon. What's there not to like about that? Examiner.com preview piece just about the music (which allowed me to visit my own hypothesis about a Puccini-Schoenberg connection). This raises the interesting question of whether or not Lloyd Webber knew just what he was stealing!